The Interim Budgets are more about Optics than Reality. After all, the government that presents the Interim government will stay in power for just a few months, in current case 1.5 months of the next financial year. The full budget presented after formation of the next government, regardless of whether it’s continuation of the present government itself or new is the one to really look forward to. 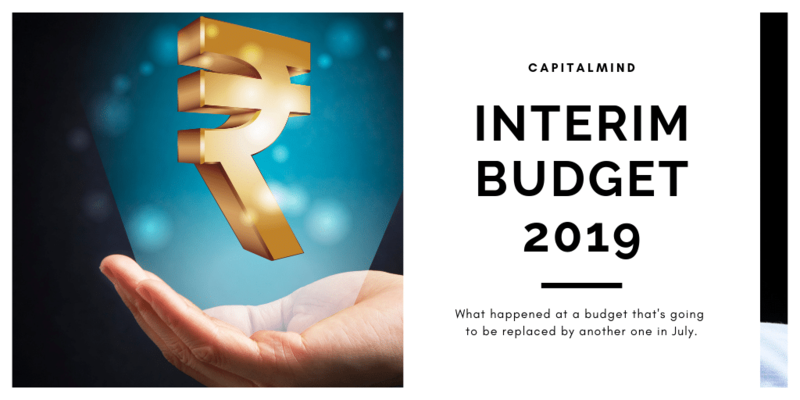 Yet, with the Election looming, the Interim Budget offers the government in power the opportunity to showcase its success, talk about all the great achievements and lay foundation stone for what they hope to focus in the coming months and years. What is important to focus on rather than the narrative is the real numbers and their changes. This post shall try to show light some of the most important ones yet generally ignored in the small print that the Budget generally is all about. In 2017, the government was able to get 46.5K Crores as Dividend from Public Sector Enterprises. This year, it expected more to the tune of 52.5K Crores but given the sluggishness has now scaled it back to 45K Crores. For the next year, the government intends to collect 53K crores as Dividend. Dividends are generally paid by companies keeping in mind the future cash requirements of the company in terms of capex. But if the owner wants more, it comes at cost of future growth. Hindustan Aeronautics Ltd for example paid 15.5K Crore to the government over a period of 15 years from 2003 to 2018. This year, it’s been forced to take an overdraft loan to pay employees. As the time frame indicates, it doesn’t matter which party is in power. A similar sized dividend packet is expected by the Government from Public Sector Banks and Reserve Bank of India. Given the state of Public Sector Banks, the majority of this amount comes from Reserve Bank of India alone. In 2017-18, the government received 44.8K Crores from RBI. For 2018-19, it expected 54.8K Crores and now estimates it will end the year with 74K Crores. For the next year, it expects to garner 83K Crores from this head. That is a serious addition which should help the government take the hits it has been forced to take elsewhere but one that came at a cost as the perception was that Urjit Patel was forced to put in his resignation on this very issue. With a new RBI governor and RBI having excess than what it really requires, the new number in itself should not be too much of a hassle. The government already expects about Rs. 20K cr. more this year in the next two months, so it’s quite likely a deal has been struck for the RBI to pay more. Next year, it’ll pay even higher. The government intends to get money from selling the share of public sector enterprises. Nowadays they also force the PSUs to buy back their shares, which for FY 2018 has added up to Rs. 80K Crore. The government expects this to rise to Rs. 90K Crore. in FY20. This would not be a big problem usually, but the government has done strange things in the past to achieve this kind of goal, such as by forcing ONGC to buy HPCL from them. The structure gives the government revenue, but it’s tantamount to a promoter forcing one of his companies to buy another one, a practice that is frowned upon as bad corporate governance. When it comes to a choice between governance and taxes, the choice seems clear. We all love if we were not required to pay Income Taxes. So, let’s look at the bright side of paying taxes. Our taxes more than compensate the expenditure on the defence of our great nation. If only the government reduced its own expenditure. But away from hopes and wishes, what is that we contribute in reality. For the financial year 2017-18, ignoring Cesses and other smaller taxes, Direct Taxes came in about 3.88 Lakhs Crores. This year, they expected this to be 4.61 Lakh Crore and for the next year, they expect it to grow to 5.40 Lakh Crore. Since there has been no tinkering with the slab rates, the 17% increase in personal income taxes is assumed to come from both higher salaries that will get paid in the forthcoming year plus better compliance. From Corporate taxpayers, the government was able to raise 4.86 Lakh Crore as Taxes in year 2017-18 which was expected to go upto 5.27 Lakh Crores. Instead, the government now believes that it can garner 5.75 Lakh Crore, a gain of 18% over last year. (Effectively, what the government is saying is that they are somehow going to get Rs. 50K crore more in the current year!) For the next year, it expects collection to move to 6.52 Lakh Crore translating into a growth of 13%. Custom Duty is another major head of Income for the Government though compared to Direct taxes, its much lower. For the last financial year, the government collected 80K Crores and expected to collect 96K Crores this year. It has now upped this to 1.15 Lakh Crore translating into a hike of 43% year on year. For the next year, customs duty is now expected to go up to 1.30 Lakh Crore. From Petroleum Products to Mobile Phones, a lot of items we use on a daily basis are imported and Customs is the taxes collected by the government. To boost its Make in India campaign, the government has raised customs duty on a host of electronic items and this could have had a role to play in the higher collections this year. With implementation of GST, Excise duty collected by the government is now basically taxes we pay on Petroleum Products. Between Basic Duty, Special Additional Duty and Road and Infrastructure Cess, the government in 2017-18 had collected 27K Crores. Thanks to the steep drop in Crude prices last year which allowed the government to push up the tax levels, this year, the government will collect 1.32 Lakh Crore. For the forthcoming year, it expects to collect 1.40 Lakh Crore from Petrol/Diesel Excise Duty alone. So, if you are expecting a fuel price cut, you can put that thought aside for now. Goods and Service Tax is the biggest single income generator for the government. In 2017-18, the government collected 4.42 Lakh Crore. It expected to collect 7.43 Lakh Crore this year but has now scaled this down to 6.43 Lakh Crore. For the next year, it expects to collect 7.61 Lakh Crore. To be clear, this translates to an income of Rs. 63,000 cr. per month for the centre. The total tax revenue received by the government for 2017-18 was to the tune of 12.42 Lakh Crore. This will go up to 14.84 Lakh Crore this year and is expected to rise further to 17 Lakh Crore in the forthcoming financial year. 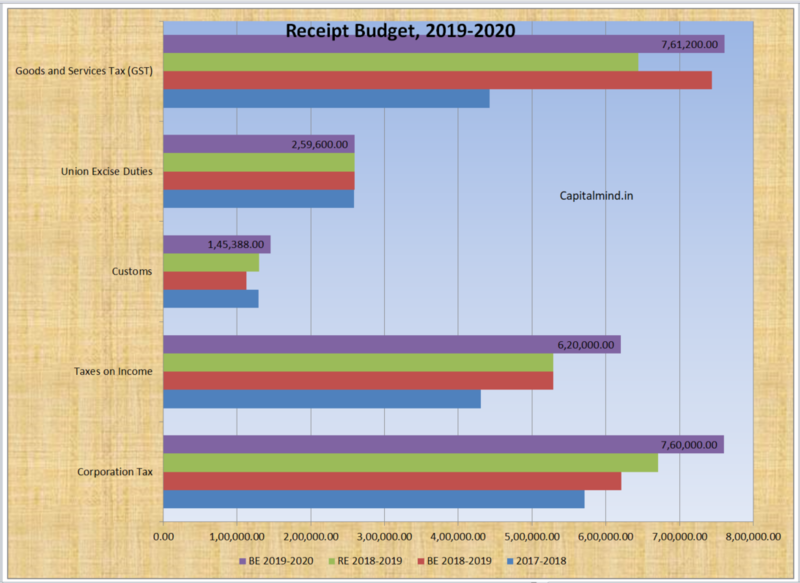 The above chart plots the differential in Receipts in Crores. 2017 – 18 is the Actual Collections, BE 2018 – 2019 refers to the collection the Government expected to collect in this year while RE 2018 – 2019 refers to what the government now believes it shall collect. BE 2019 – 2020 refer to the collections that the government assumes it shall collect in the forthcoming year. This is the percentage break-up of how much of the revenue comes from various heads. As you can see, GST and Direct Taxes make up for 84% of the Income with others contributing the rest. 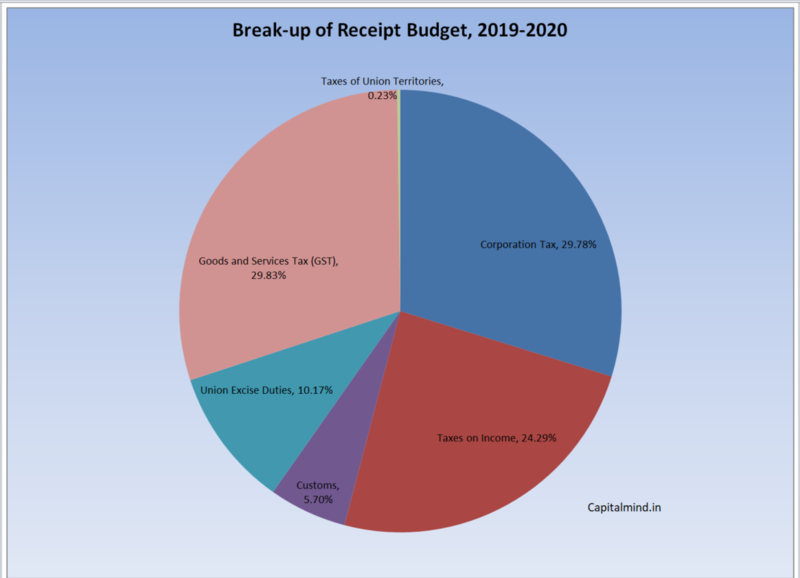 A 20 lakh crore rupee revenue budget (17 lakh cr from taxes, 3 lakh crore from other stuff) is huge – and nearly 10% of GDP. But it’s still nowhere close to the kind of expenditure the government has to make. In our next post, we shall look at how the government spends this money and more.